The school provides a daily Reconstructive Language Program (a phonetic language program that focuses on oral reading, reading comprehension, spelling, vocabulary and written expression) and multi-sensory classroom presentation. Gow's solid college preparatory curriculum with a diverse fine arts and full interscholastic athletic program focuses on a boy's talents while strengthening his academic foundations. Classes meet six days a week and are small in size, with a 5-1 student/faculty ratio, allowing an individualized program for students. In addition to regular classes, the last period of the day is set aside for individual students to work with their teachers on areas where they need extra help. Faculty members at Gow are specially trained in the teaching methods that are effective in helping dyslexic students succeed in the classroom. Each student spends two hours and fifteen minutes in a supervised study hall, Sunday through Friday. Teachers circulate throughout the session to help students concentrate, to answer questions and to support the discipline that our students must develop if they are to progress effectively in their studies. All honor scroll students may study in their dormitories. Some juniors and seniors study in their dorms if they maintain a strong grade point average. Diagnostic testing, school transcripts, recommendations and a personal interview are all required parts of the admissions process. A typical visit and interview includes specific skill assessments to determine class placement, lunch with students and faculty, a class visit and a tour of the campus. Before being accepted into Gow's program the school reviews documentation, which would include current cognitive evaluation and achievement testing assessments, to identify an applicant's learning difference. Students enrolled at Gow have a deficit in one or more of the areas that Reconstructive Language would address. Approximately 40% have an additional attention deficit disorder. 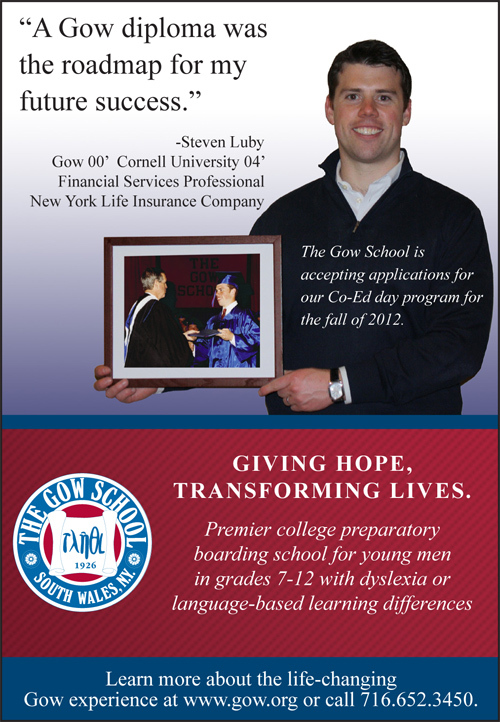 Gow has a selective admissions process and is dedicated to providing appropriate accommodations and remediation. Working closely with the school's College Advising Center, 100% of our graduates are accepted and enrolled to a college or university. The Gow School is committed to physical growth, fitness and athletic competition, believing that sports help to assure a well-rounded education. The athletic program emphasizes the values inherent in physical well-being, fitness, teamwork and competition. The school's teams compete with nearby public and private independent schools. Campus clubs, organizations and activities at Gow reflect the diverse interests of our students. Students are encouraged to add their talents to existing organizations and to initiate new ones. In addition to on campus activities, supervised travel enhances the student experience. Many courses incorporate field trips in to the semester's work, including visits to lectures, museums, plays and historical sites. Many students meet girls from local public and independent schools and go out on dates on the weekend. Each Saturday evening, busses take many students to a local mall to shop and see a movie. Other activities include symphony and rock concerts, ethnic festivals, NHL Hockey games, NFL football games, skiing at local resorts, snow tubing, snowboarding, bowling, laser tag, sledding, NBA games in Toronto and NLL games. There are frequent breaks during the academic year. There is a 5-6 day in October following Fall Parents Weekend, 10 days at American Thanksgiving, a 2.5 week winter break, another shorter break of 5-6 days in February, and two full weeks in March. All students live in dormitories where they learn to share their experiences with one or more roommates. Each dormitory room is wired for cable TV and is connected to a telephone system which allows them to be on-line and in contact with the world. The Gow School Summer Program is a five-week traditional summer camp experience for 100 boys and girls ages 8-16. It combines learning and fun! It is a combination of three components: Summer School (an academic program which provides an excellent remedial curriculum for students who have experience academic difficulties or have language based learning difficulties), Summer Camp (traditional camp program), and Weekend Overnight Tours (both educational and fun). The program has been successful since its beginning in 1990.